I would like to give some basic thoughts on I respond to an oft posed atheistic objection: Do I eat shellfish? Absolutely. Do I wear clothes of mixed cloth? I am right now. Well then, according to the atheist, I must be “cherry picking” from the Bible the verses that I want to believe and the ones I don’t, especially those from the Old Testament Mosaic Law. This is another very common mistake that many lay skeptics make. Ironically this was not a big complaint from atheists in generations past because they were familiar with the Christian theology of the New Covenant. Basic theology and hermeneutics was commonly part of primary education. However, many modern Atheists just do not take the time to actually familiarize themselves with Christian theology and the history of interpretation before they begin blindly flailing about with their objections, hoping that something, anything, will stick. The reason why Christians do not adhere to these kinds of laws from the Old Covenant has literally nothing to do with some kind of textual cherry picking. This again is a long standing theological distinction made based on the New Testament and Covenant Theology. Again, you do not have to believe that the Bible is TRUE on this, but you can at least attempt to understand what it says and means. Christians do not have just the Old Testament. We also have the NT and read the entire book as being a continuous whole (diverse as it may be). Anyone who has read Romans, Galatians, Ephesians, and Hebrews will know immediately that the answer to why we do not follow the OT Levitical law in detail is theological. I’ll try to keep this as brief as I can but such atheists are basically asking a question that involves the relationship between the Mosaic Covenant with the Nation of Israel and the New Covenant with a redeemed people (not a geo political nation). I’m gonna do this in simple list format to make it more brief and easy to respond to specific points if you so choose. 1. Christians have, since the earliest writers (we see it in the 4 NT books I listed above as well as other places like Acts 15) seen a distinction between 3 different KINDS of OT Laws: Civil/magisterial laws (taxation, penal code, kingship, etc. ), ceremonial/priestly laws (sacrifices, clean/unclean, holiness codes, structures of worship, etc.) and moral/ethical laws (decalogue/10 commandments, etc.) Again, this distinction did not arise as a response to the challenge of “Cherry picking” but has been a long standing theological distinction since Paul and even Jesus. We will see in the next few points why this distinction is important to keep in mind. Now, is the intent of this law that it is morally good in and of itself just to have a parapet (a small fence) around one’s roof? No. The ethic behind this is clearly that we are responsible to make sure that our properties are safe and that if we do not adequately build or maintain our properties then we are liable when someone gets hurt on our property due to our neglect. It is basically an early version of building safety codes. 3. The next concept is that many of these laws are used as something like “life illustrations.” This is a hard concept for modern hearers to grasp because we don’t really have laws like this anymore. These laws are meant to be kept to remind the Jews of their need to be holy and not give in to other religions or immoral practices. So when they only wore unmixed clothing they were to be reminded of their need to not mix their lifestyles with the lifestyles of the Canaanites for example. So some laws are in place as life illustrations and reminders to the Jews of their history and their standing as a distinct and hopefully holy people. When they went into other lands and had to be particular about the food or the cloth that they bought at market, it would be a reminder to them and possible even a way to share God with other people. a. Preamble – the initiating party involved says who they are and what they have done. b. What the agreement is – the obligations of each party. c. The blessings and consequences for keeping/breaking the covenant. Now covenants can be either conditional or unconditional. A conditional covenant basically says that the covenant is only valid so long as the parties are faithful to their respective obligations. If they are faithful then the blessings from C are received. If they break it then the consequences of C are received and the covenant ends. An unconditional covenant is long standing regardless of the faithfulness of the 2nd party. It is a unilateral promise of the initiating party to the receptive party. This means that regardless of the faithfulness of the receptive party the initiating party would continue to give the blessing. Again we will see why this concept is important to keep in mind. Paul here condemns Peter (Cephas) for forcing gentiles to adhere to the OT ceremonial laws – he says that it is actually contrary to the gospel to force Christians to live by the OT civil and ceremonial laws. Now, I know this has been somewhat long, but the point is that when an atheist wants to say that Christians are just “cherry picking” when they do not live according to OT law it shows that they are just not familiar with NT theology and the long history of covenantal theology. I’m also not saying that one cannot read the Bible for themselves. I am simply saying that in order to understand what an ANE author MEANS takes some study precisely because it is so foreign to us. I like to use the example of Dante. If you read Dante without a critical edition with all the footnotes it is almost impossible to appreciate the meaning of most of the text. Sure you might be able to come up with the overall theme and narrative flow of the book, but almost every stanza is chalk full of allusions and historically derived images and themes. He shall hunt her through every nation of sick pride. One would NEVER be able to say that they have understood what that stanza meant if you do not study the history of it. So why do we think that the Bible which is written in a completely different time, on a different continent, in a different culture in every possible way, in a dead language, from a different worldview would not take study to even understand what the author meant? So again, all of this does not mean one cannot read it on their own, but it does mean that in order to interpret what the text MEANS, it will often take quite a bit of study into the backgrounds and contexts of the texts we are dealing with. On a post about morality on atheist apologist David McAfee’s group page, I was in a discussion with David’s girlfriend and another gentleman and was pointing out the difference between ontology and epistemology (that iron rods remain solid because of what iron IS and not due to what we believe/know about it or how we come to that belief/knowlege). 3. unmarried, because I am so pathetic no one would ever marry me. I responded by apologizing if I had said something to offend her, and continued to try and keep the conversation civil and honest and simply asked for more clarifications about her answer and if she really did think that it was the testing that caused the metal’s solidity. Her hostility simply escalated. After this, NJ Bruzzese (naturalist, agnostic/functional-atheist host of The Skeptics Testament) then joined in and also tried to help her see that this distinction between ontology and epistemology and that this is not a point of contention for any philosophers and is not something that really is distinctively Christian or theistic. We both tried to point out to her that this is really basic philosophical categories and nothing to get bent out of shape about. 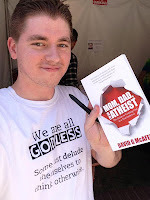 Another atheist, Brandon Christen, also read the thread and noticed the nature of David’s girlfriends comments – he would later respond to the controversy. The thread was suddenly, and without warning, deleted. NJ accidentally posted his comment on the main page not knowing the thread was deleted and then at that point, NJ, myself and the other atheistic member of that group continued the conversation very openly and honestly and with great civility. David McAfee suddenly posted that he would like this new thread to end and promptly deleted the post and then BANNED NJ and myself from the group. Following this Brandon then commented on the group’s page that he was surprised, and somewhat disappointed, that a group that was supposedly dedicated to free thought and reasonable dialogue, would not only delete multiple threads challenging the views of the group’s administrator and his GF – and not even religious one’s but basic philosophical understanding of what ontology and epistemology are…) would be censored and banned, whereas the commenters who routinely mock and ridicule and launch personal attacks against people do not even get so much as a slap on the wrist. Brandon was told by David McAfee that he could go elsewhere and was banned from the group as well. For those who where in any doubt that there are anti-theistic fundamentalists, this is evidence for you. He censored a theist, an agnostic and an atheist, deleted multiple threads and banned us from his group after allowing his followers to resort to nothing but ad hominems, personal attacks, and derogatory rhetoric. Why? Because we pointed out that there is a difference between ontology and epistemology that might (MIGHT) challenge one of his views. Nothing like censorship to show one is a “free thinker”.